The largeness of this apolytope looses the distinction of it's lines when it is displayed to largely?Garrett Lisi may have pinpointed aspect of this flower as he points to the petals? I had to look for how he descriptively displayed the pattern of those petals, as he choose to represent this expression as a "modality in perception." I left a remark at Clifford's blog in relation to the flower, because it is very symbolic to me about what can emerge within context of our own consciousness. That it could encompass my whole life. I would not present this perspective if I did not realize there was a functioning pattern within myself that I identified through study of my own nature. 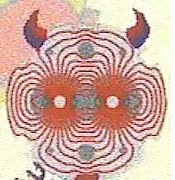 This pattern becomes reflective of how one can assign one's belief's to the world, and this is how I see this as an aspect in each of us. 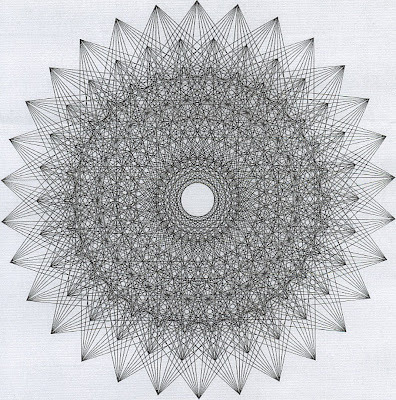 How this pattern is the reflection of what exists as a very bright light at our centres. This to me is the energy force and momentum that moves our lives to the expressions that we do, while it also reveals the aspect of the life, and the expressions which are shadows of the very reflection of that light. 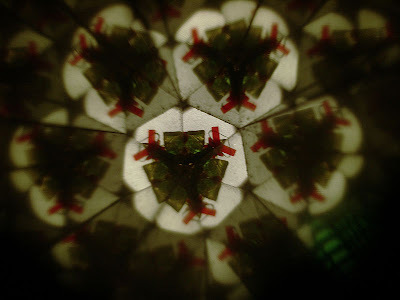 A kaleidoscopic pattern made using a simple toy kaleidoscope tube. The kaleidoscopic pattern metaphorically used as an expression of all life for me then? Now, there are other images besides flowers that also occupy my mind I perceive as holding an expressive tendency of the energy expression as a pattern of being. Now sure I could be pegged as some one who delves on the fringes of what is the shadows of things, and while being perceived as such, is somehow ineligible to be part of this commentary on the energy of expression, as a pattern in one's life? Yet I do not believe that any of us can be said not to have this privilege, because I see it is an integrate part of our persons and our characters. Yes, you can look at the whole person, and the matters that describe the reality, but it is much more that energy can explode into this reality that exists, and it all came from some centre? Yes it's true I believe that the tunnel to the light, is a perceived way in which the soul in expression manifests itself into the world we called waking reality. It provides new meaning for, "light at the end of the tunnel" and how far an introspective view shall you take this to mean, we have come to a clearer perception of the reality of the situation in your life? But yes, we sleep and life consolidates too. It would not to be to far off the mark that the seed and it's growth could mean much more as we reread the quote I give of Plato's, that has become the food for thought about life as an "expression of being." Let's look at again now in context of this post? "AND we should consider that God gave the sovereign part of the human soul to be the divinity of each one, being that part which, as we say, dwells at the top of the body, inasmuch as we are a plant not of an earthly but of a heavenly growth, raises us from earth to our kindred who are in heaven. And in this we say truly; for the divine power suspended the head and root of us from that place where the generation of the soul first began, and thus made the whole body upright. When a man is always occupied with the cravings of desire and ambition, and is eagerly striving to satisfy them, all his thoughts must be mortal, and, as far as it is possible altogether to become such, he must be mortal every whit, because he has cherished his mortal part. But he who has been earnest in the love of knowledge and of true wisdom, and has exercised his intellect more than any other part of him, must have thoughts immortal and divine, if he attain truth, and in so far as human nature is capable of sharing in immortality, he must altogether be immortal; and since he is ever cherishing the divine power, and has the divinity within him in perfect order, he will be perfectly happy. Now there is only one way of taking care of things, and this is to give to each the food and motion which are natural to it. And the motions which are naturally akin to the divine principle within us are the thoughts and revolutions of the universe. These each man should follow, and correct the courses of the head which were corrupted at our birth, and by learning the harmonies and revolutions of the universe, should assimilate the thinking being to the thought, renewing his original nature, and having assimilated them should attain to that perfect life which the gods have set before mankind, both for the present and the future." What use any author if he cannot point out the "depth of thought" that one can go into by leaving a "tidbit of information" so that one can be motivated to look at the whole picture and not just, "part of a mystery?" An assumption is made of the person, and from it the world views settles accordingly. Life becomes easy wrapped then to this meaning and we soon learn, where each of us has left "the synergy of the situation they are in," and realized, the counterpart is and will always hold a greater meaning. 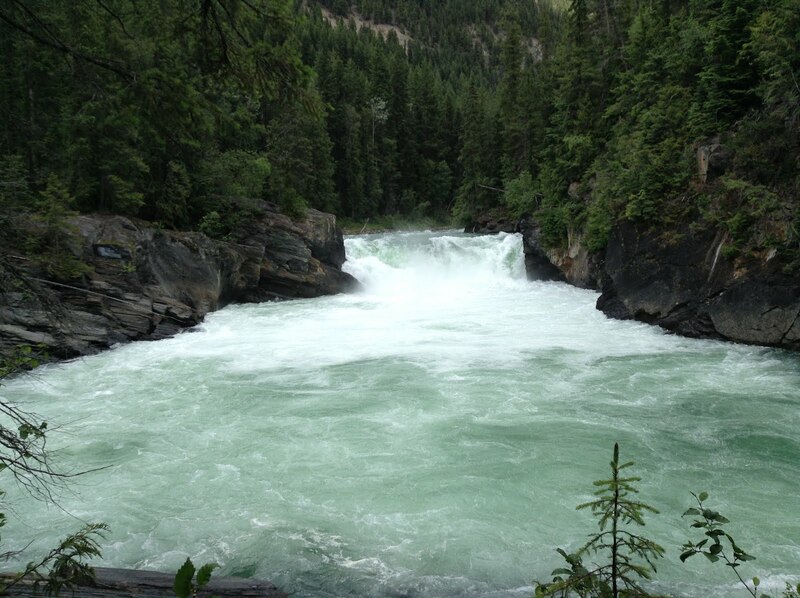 That we share this aspect of nature we have come to perceive. Crab apple blossom We planted this in memory of a grandchild called Summer, who passed after being born. It was a way to remember, that life is "spring's eternal." 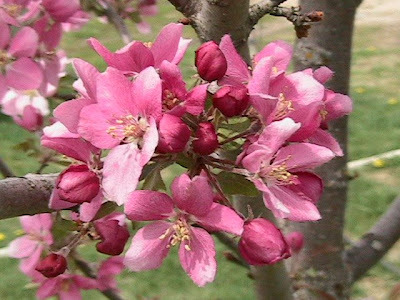 Unfortunately, we had to leave it behind as we moved on, yet, is holds greater meaning now that we remember her, as we look at the blossoms. The pathway of expression is an indelible feature then in my mind that it can follow an expression, and what was the origination of this motivation? If it is life as we know it, and it can impel a whole universe, why cannot this energy be impelled by some motivation from within you? All life? Spintronics (a neologism for "spin-based electronics"), also known as magnetoelectronics, is an emerging technology which exploits the quantum spin states of electrons as well as making use of their charge state. 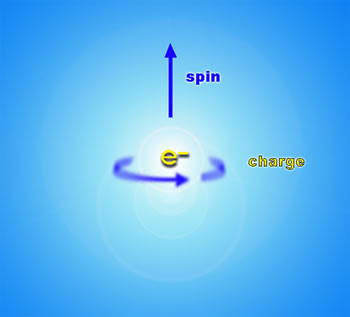 The electron spin itself is manifested as a two state magnetic energy system. The discovery of giant magnetoresistance in 1988 by Albert Fert et al. and Peter Grünberg et al. independently is considered as the birth of spintronics. Racetrack memory is an experimental non-volatile memory device under development at IBM's Almaden Research Center by a team led by Stuart Parkin. In early 2008 a 3-bit version was successfully demonstrated. Developed successfully, racetrack would offer storage density higher than comparable solid-state memory devices like Flash RAM and similar to conventional disk drives, but with much higher read/write performance. It is one of a number of new technologies vying to become a "universal memory" in the future. Spintronics Devices ResearchRacetrack Memory, Spin Injectors, Magnetic Tunnel Transistors, and a host of more exotic spintronic designs take us beyond the realm of the simple GMR spinvalve. Magnetic Monopoles in Spin Ice See my comment there for computerize correlation defining elementary particle creation. Comment in full below until post recognition. 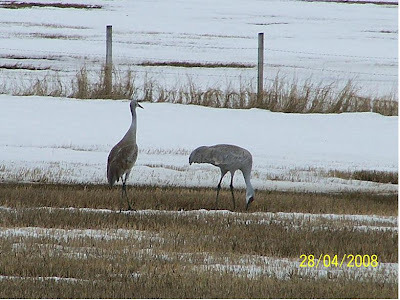 On the drive into town today, my wife pointed out these birds in the field above. She went back later, after arriving at home and unloading the building supplies we needed. We have never seen them before. 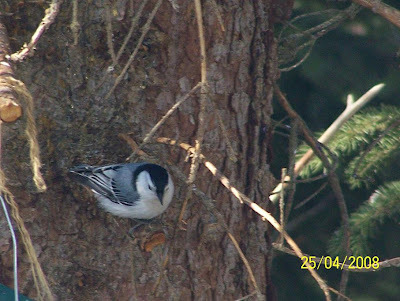 She is the picture taker in this family and she has us looking at the different species as we sit at our dining room table, looking through the patio doors to the feeders she has placed amongst the trees. The Varied Thrust and the Nut hatch are new for us to see around the feeders. The "Evening Grosbeaks" still pay us a visit on a regular basis. 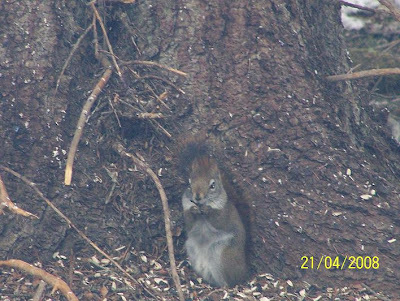 One thing you can be assured of is the healthy population of squirrels. 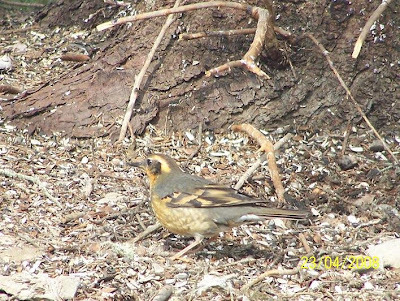 They maintain their occupation over the food while some of the birds themselves feed. See:Wildlife and related links there. What is beauty in face of simplicity? >Beauty, Plato wrote, is not easy to define, but something that "slips through and evades us". For this reason, many logic-oriented philosophical approaches tend to divorce and even oppose truth and beauty. "The question of truth", wrote logician Gottlob Frege in one of his most influential works, "would cause us to abandon aesthetic delight for an attitude of scientific investigation." Welcome to the Mind and Brain Portal. This is an interdisciplinary point of entry to such related fields as the cognitive psychology, philosophy of mind, neuroscience, and linguistics. Damasio's Second LawEmotions precede feelings. Consciousness emerges when this primordial story-the story of a object causally changing the state of the body-can be told using the universal nonverbal vocabulary of body signals. The apparent self emerges as the feeling of a feeling. When the story is first told, spontaneously, without it ever being requested, and furthermore after that when the story is repeated, knowledge about what the organism is living through automatically emerges as the answer to a question never asked. From that moment on, we begin to know. IN the "primitive aspect of being," I was hoping one would see through to the realization that if Antonio was to present a clear and precise definition of the way we evolve then what use to see that such an elevation of the perceptions of Jill Taylor could have amounted to anything? But wait, she experiences the stroke and that's physical isn't it? And thus, she was truly lead to such an insight? The point is this. That in order for have such a state to go too, it had already to exist? This goes to the articulation's of how Antonio sees? This then is the challenge to replace the way he articulated his points of reference, too one saw in another way. Yes, there is a physical process with the DNA and such. What use to overcome the physical attributes of the lower centres if we can ascribe to one that there is much higher perspective then what is currently understood? See in between the moments of time, are the digging deep of what passes for our attentive views, to see that the depth of perception is an accumulative thing too. 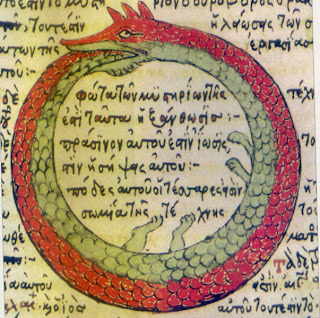 The Ouroboros, also spelled Ourorboros, Oroborus, Uroboros or Uroborus (pronounced /ˌjʊəroʊˈbɒrəs/ or /ʊˈrɒbɔrɔs/), is an ancient symbol depicting a serpent or dragon swallowing its own tail and forming a circle. It has been used to represent many things over the ages, but it most generally symbolizes ideas of cyclicality, unity, or infinity. The ouroboros has been important in religious and mythological symbolism, but has also been frequently used in alchemical illustrations. More recently, it has been interpreted by psychologists, such as Carl Jung, as having an archetypical significance to the human psyche. Some who had been followers of my blog are familiar with my references to Carl Jung. You had also seen my reference to Sir Isaac Newton and his relations to Alchemy which many would like to dispel with. As you can see with my emotive descriptions, I am very much concerned with this action, that the essence of distilling the finer aspects of our being, are the anatomical substances of those same emotive inclinations housed in experience. So if you were able to use the crucible and combined the proper substance of these emotive experiences, what value could we have found in placing in every person this Philosopher stone? What the Crown is to signify? The alchemists, who in their own way knew more about the nature of the individuation process than we moderns do, expressed this paradox through the symbol of the ouroboros, the snake that eats its own tail. ouroboros, has been said to have a meaning of infinity or wholeness. In the age-old image of the ouroboros lies the thought of devouring oneself and turning oneself into a circulatory process, for it was clear to the more astute alchemists that the prima materia of the art was man himself. The ouroboros is a dramatic symbol for the integration and assimilation of the opposite, i.e. of the shadow. This 'feed-back' process is at the same time a symbol of immortality, since it is said of the ouroboros that he slays himself and brings himself to life, fertilises himself and gives birth to himself. He symbolises the One, who proceeds from the clash of opposites, and he therefore constitutes the secret of the prima materia which [...] unquestionably stems from man's unconscious. While these are not the scientific allegories one like to hear in the science world, shall I condemn Martin Rees fro introducing such an symbol in the penetration of the Universe's cyclical nature as we join the the very large with the very small. How about including Holism and Reductionism as a complementary model while we look deeply into the definitions of the brain as a whole, while not distinguishing it's part? left/right brain? Holism (from ὅλος holos, a Greek word meaning all, entire, total) is the idea that all the properties of a given system (biological, chemical, social, economic, mental, linguistic, etc.) cannot be determined or explained by its component parts alone. 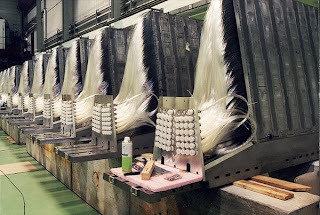 Instead, the system as a whole determines in an important way how the parts behave. The general principle of holism was concisely summarized by Aristotle in the Metaphysics: "The whole is more than the sum of its parts." Reductionism is sometimes seen as the opposite of holism. Reductionism in science says that a complex system can be explained by reduction to its fundamental parts. Reductionism essentially claims that chemistry is reducible to physics, biology is reducible to chemistry and psychology and sociology are reducible to biology, etc. Some other proponents of reductionism, however, think that holism is the opposite only of greedy reductionism. Looking for a unitary alliance between quantum realities and the the world at large are the recognition that in the end, like the distinctions of left/right brain cannot be taken alone, and not as some larger perspective that is necessary in being. Yet enclosed with this very thinking is the idea of position and momentum? I think this is part of the discovery of who you are. What makes up the person that has slipped ever so gently into this matter defined state. Who would of thought the elements of entanglement could have meant that energy and matter intertwined could have the oscillatory nature of this person become "who it is" by defining the atmosphere of it's relations with the world. So technically, if we see the vast resources of so many bodies, what is relevant to our species that we could say there is indeed eternal hope that we will one day return to the very places we all arrived from? What happens to that "I am?" I may of gone to far here for the minute because what I wanted to focus on was the recognition of those things that are primeval in all of us. Things that from such an elevated state of perspective are recognized. That while the elements of the physical are apparent in Jill Taylor's observations, it was through that "ancient part of our brains" that evolution has redeemed itself by the very evolution of perspective. We have somehow elevated the existence of being apart from the containment? But in the meantime, there is a "relativity of being" that all things hold us to the ground, while the recognition of those things that are much more ephemeral in nature, can be the elements of emotive states of recognition that bind us firmly to our abodes. While thinking about the ephemeral quality of the emotive states, and fully understanding this anatomical relation, I thought of these emotive elevations/descents and such. It was more the work for me to realize that the quality of perspective could be ruled by such "emotive states of recognition" whether you can identify these on your own or not. They were experientially defined in our relation and anatomically ruled by our minds, whether we could separate from them or not, was never the "not accepting ownership" that I would have implied through recognition, but the realization that we are all imbued with the elements of this "facet of being." So we have Jill's perspective of her hand holding onto her cardio glider? Such observation qualities of mind and viewing from such a space, is the work of assigning responsibility to what we have become entangled in, in our acceptance who heartily of becoming the bodies in which we live. Martin Rees begins, and ends his lecture with the understanding of a given space. If one had thought about the energy valuation of this given space, then what values could be reduced "from the beginning" to define it in these matter defined relations. You had to have a way in which to perceive the given reality at a time before the immersion of these rarefied thought forms that descend into the matter definitions of existence? The grounding of perspective is the direct relation to how we perceive the elements of our physical bodies, to it's most densest form. While of course we recognize the degrees of the different phases of the elemental states,? It is with such conviction that I saw this relation to what defines the body our home, and what can be the bodies highest aspirations in terms of it's functionality as producing such thoughts. While Martin Rees defines this ability of the culture as a sliver in the macroscopic relation of where humanity sits now, the final hour, is a transformational attitude about where we are going as a species? That while all things things can be mapped to their biological nature, did we ever recognize the finer forms of manifestation that are revealed? Whether we accept the emotive states purely as anatomical, or, whether we plainly accept these mental capacities based on the neuronical processes alone? So that is where I went in my journey was to define this "relativity of mind" in full acceptance of what Einstein may have implied in the "measurement of that time" based on our emotive relations, and acceptance, of this relation in the human experience. I based it on a much finer forms of realization, above the most rarefied matter states that one could think of, to develop a "model of understanding" beyond the limitations we had assigned the physical basis of our relations as a human form. See: Lightening, as Strings Strike? Often taking the time to absorbed the full perspective of the writer is just as much an effort as it is to understand the nature and understanding of research and information development about a topic. Where that writer leaves off. What space has this writer given us, as we look forward to the future? What valuations do we then assign the places in television as we have become numb to the experience of discovering who we are? So I do understand the wider perspective here about what people can do to each other as we select and transcribe the future prospects of where we want this society to go. I had learnt about this aspect of numbing as I realized that it was just as great an effort to awake our own selves to the subtle perceptions of existence, as it was to respond most appropriately in our views on the things that we had taken into our beings for assessment. It was "as if" we could find that "space in time" where we could "stop time and look in between the clips of our everyday experiencing" and realized then, that in every moment of time as an arrow, human experiences follows? There was that place to awaken our ingenuity of mind to the discoveries of the world around us. His book still stands as a classic. But one of L.A.’s best-known residents wants it understood that when he wrote it he was far more concerned with the dulling effects of TV on people than he was on the silencing effect of a heavy-handed government. While television has in fact superseded reading for some, at least we can be grateful that firemen still put out fires instead of start them. How subtle this point about this identification of this question on creativity,"What does "creativity" mean in our lives? that it could be thrown in the mix? There was a greater story here waiting for us in the wind? How unpredictable the weather to see that in the third valley of Amy Tan's exploratory journey, that while she in writing sees the object of stones as a part of the story line, then finds reality has been kind to her, that such serendipity is the realization that all things will come home to roost. So too in this aspect and understanding, do I find, that the word "creativity" is a funny thing that such "determinisms are factored with it." That such ideals and relations become the "correlations of cognition" that I had found opening in my own life. It was by discovery of such a method in a literary device I could, look at what other authors were doing as they began their stories. How was I to know that the very search I had put myself on would lead me here or there, and to understand, that I was seeing into the future, and the future was coming home to see me? The discovery of Plato and his Dialogues were a lesson in mind that I had come to look at, as if, the Dialogues themself were a method by which such perspectives could have pointed toward a future. An outcome, determined by the very process of bringing forth the "point of view", whether by a "truer character of being," or some form of left right brain dialogue of coming to a consensus on that oscillatory moment. 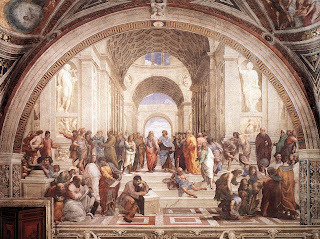 That two such positions could have been adopted in the painting of Raphael in the Signatore's room at the Vatican, was a deeper recognition to me of the creativity we can assign such outcomes by placing Plato and Aristotle under such such an "Arche." The "centre of the painting" is itself to draw attention to all the events that were happening in the school(A Royal Road to Geometry? ), but to bring us back to this centralized position within ourselves. To brings us back to the very questions about the relationship of this teacher and student. This was a foundational perspective that was a sign of the times to me. 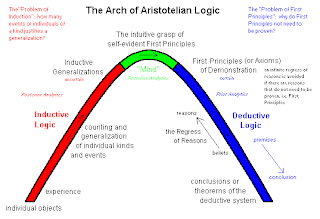 While we look at the inductive/deductive relation of what such an Arche represents, it was a method that by such induction/deductions of such things were to become "self evident." This dialogue could be wide sweeping, as we take Aristotle gestures and a sweep of the hand, while Plato, points to a higher purpose, and the revelation of where ideas come from. This is a source of inspiration to me that such deductions while delineating a pathway to historical context, has a relevance to what was always known. Was alway there to be discovered, We just did not realize it yet. "The Teacher and the student" could exist in each of us. What choice would you have while on such a search to know that while there was never the possibility to assign ourselves to this group or that, that you were to wear the stripe and pattern of, and then loose that part of yourself that was till on the journey? The probability of new language development was the realization that from insightful development each of us holds the ability to warm up to the idea of what creativity means in our lives. While we gesture ourselves to that future and PLATO'S HAND, and how IDEAS could descend into every thinking mind that opens itself to such a pathway? Why would he just settle with shaking a president's hand while he was being misinterpreted and was left without a voice? Should we assign such a deduction to what the avenues of new technologies appeal to the nature of "numbing the senses" or, point to the realization, that such devices will allow "fine openings and apertures" which revealed the truth of that ever searching mind? Amy Tan reveals a thinking of mind that allow me to write on the "Character of our Heroes," to imply that we had to let go of our prejudgements in order to fully experience the methods and thinking of those historical figures.Sensing who they were in their totality. Amy Tan revealed that writing on a particular place in China, the village that she was to write about suffered a terrible loss(sixty homes burnt) and the individual who caused that incident, was to bear the brunt of the village justice. In order for Amy to live and breathe that village, she had to pull back her own opinions about what justice was in order for her to write of the discipline and justice applied to that man. Removing her opinions, and "moving into that space" was to try and expeirence the story fully. Let the story to be written. So here's the thing. I see the body as a tool for our spirit to manifest, and if we assign the expression of this spirit through the delegations of the brain's hemisphere, then what does this mean about the reality of the idea of position and momentum in our experiencing, if we had thought that such division would have relegated the experience to aspects of the right and left hemisphere? The link offered by Phil, put this question in my mind, as I am trying to see the place my fabrications of mind as the penetrating of experience reside in the hemispheric association, sees, that such mapping can be assign a introspective measure of our realization of the right brain experience Phil offered in this link. If we were to think of the oscillatory relation of position and momentum as a feature of the reality we reside in, then the very stages that the "I am resides in" is a fixation of the reality itself. While this can be reduce to a mathematical framework, this aspect of the uncertainty, would have then become the mattered states of existence, as we have come to define aspects of that same reality? A cerebral hemisphere (hemispherium cerebrale) is defined as one of the two regions of the brain that are delineated by the body's median plane. 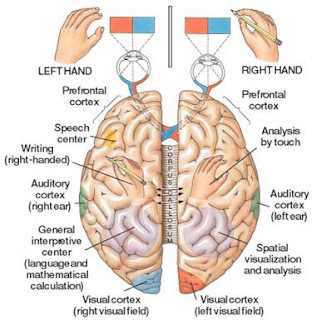 The brain can thus be described as being divided into left and right cerebral hemispheres. Each of these hemispheres has an outer layer of grey matter called the cerebral cortex that is supported by an inner layer of white matter. The hemispheres are linked by the corpus callosum, a very large bundle of nerve fibers, and also by other smaller commissures, including the anterior commissure, posterior commissure, and hippocampal commissure. These commissures transfer information between the two hemispheres to coordinate localized functions. The architecture, types of cells, types of neurotransmitters and receptor subtypes are all distributed among the two hemispheres in a markedly asymmetric fashion. However, it must be noted that, while some of these hemispheric distribution differences are consistent across human beings, or even across some species, many observable distribution differences vary from individual to individual within a given species. Broad generalizations are often made in popular psychology about certain function (eg. logic, creativity) being lateralised, that is, located in the right or left side of the brain. These ideas need to be treated carefully because the popular lateralizations are often distributed across both sides. However, there is some division of mental processing. Researchers have been investigating to what extent areas of the brain are specialized for certain functions. If a specific region of the brain is injured or destroyed, their functions can sometimes be recovered by neighbouring brain regions — even opposite hemispheres. This depends more on the age and the damage occurred than anything else. Map of North America from 1566 showing both Terra In Cognita and Mare In Cognito. Terra incognita (with "incognita" stressed on the second syllable) is the Latin term for "unknown land", used in cartography for regions that have not been mapped or documented. 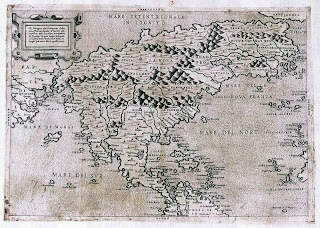 The equivalent on French maps would be terres inconnues (plural form), and some English maps may show Parts Unknown. An urban legend claims that cartographers labelled such regions with "Here be dragons". Although cartographers did claim that fantastic beasts (including large serpents) existed in remote corners of the world and depicted such as decoration on their maps, only one known surviving map, the Lenox Globe, in the collection of the New York Public Library , actually says "Here be dragons" (using the Latin "hic sunt dracones"). Terra incognita may also refer to the imaginary continent Terra Australis. During the 19th century terra incognita disappeared from maps, since both the coastlines and the inner parts of the continents had been fully explored. The phrase is now also used metaphorically by various researchers to describe any unexplored subject or field of research. I added the "T" for a affirmative statement of the There Be Dragons as a question at hand? "Here be dragons" is a phrase used by cartographers to denote dangerous or unexplored territories, in imitation of the infrequent medieval practice of putting sea serpents and other mythological creatures in blank areas of maps. The earliest known use of this phrase was in the Latin form "HC SVNT DRACONES" (i.e. hic sunt dracones) on the Lenox Globe (ca. 1503-07). The term appeared on the east coast of Asia. Earlier maps contain a variety of references to mythical and real creatures, but the Lenox Globe is the earliest one to bear this phrase. So you got to know that with a statement like, What are the Odds, we might have a truly based reasoning that underscores the importance of presenting the work toward the answer for every statement that causes uncertainty? Not assigning Dragons to unknown territories in terms of new information. I just want to point out something that has crossed my mind in terms of our past. That in the ole European identification processes names were given to people by the places they had inhibited. The End of the World Scenarios? What is in the fate of hands who will determine how secretive this world will become Dorigo. That while they advocate their positions on what is shared by our scientists, what can now be brought to bear on the "false thoughts and illusions" that new stories are forever created, while the true sources of knowledge are being clouded? Even I can be harsh in my criticisms, and it is my family trait, that when you come from a very large family you tend to care for those less advantaged then others. It's just part of the psychology that we bring to bear, as if a mother taking care of their young, could turn into teachers, "who take are of their students." The Angel and the Demons are here and not here. :) Okay, just a teaspoon of the anti-matter then. No molasses, or anything more profound then? 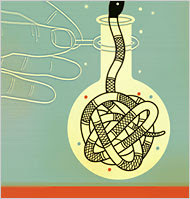 The mystic in science is always the infancy of something much more profound? So now being so much more analytical? So easy to denounce our pre-understanding of the larger possibilities, and pass it off to the experts. Then we have all our answers set in stone. Yes! It is always safer to scoff at what we now determined as safe, but then, who of us hasn't realized that with more knowledge we understood something more? With the reports I had read to update I realized there were a lot of scientists who just did not know what was being talked about, while at Cern, they were quick to dispel what proposals were set forth with the uncertainties. These were respectable attempts at informing the public. There were reports on strangelets that were answered and these were taken seriously. Least we forget how unsettling the "God particle was" while the Fly's eye was in it's infancy? You see, this is the way of it, and this is the way that those who condemn, light the fires of opposition to what should or should not be revealed to the public. It is our nature to call this thing a Geon possibly? It's clue to our saying goodbye to men who dream up the nature of things. Should we forget how those who denounced the avenues of string theory were quick to spell out where the genus figures left off, are now much further then some of our good scientists previously understood? Storms in teacup I, II III, etc.... for sure. :) You were much nicer to the child on the bus. How wise and prudent our words when there are young ears around to hear,and I have often be scolded by my wife for forgetting about the children. The circumstance in which I am working. So it is not hard to see the reverberations of my not being careful in what I've seen of the children of late whose language has become the reiteration of the circumstance in which they are raised. So can I say that the young in mind are adults whose ears are listening as well, in the matters of their age, are the students of the process and are listening as well? Harry Campbell Source from article above. Beware of the symbolism then used by Dennis Overbye to further this "scoffing at of the ridiculous." These too have a lasting impression. Least we destroy the characters of our heros? See Sir Isaac Newton again for comparisons of what ill fate would be assigned to the ones who reached for the light ,and saw all it's possibilities? So yes there are the creative writers who embellish the situation that help create this hysteria of the uncertainty. Who also bring forth such lovely stories of the fictional that we can somehow relate these events in our time as above? Mirror world or Alice in Wonderland, we have a unique way of adding the incredibility to the credible? Should one think we should dismiss the historical context by assigning comments to the characters of that past? See the "Character of our Heros" for an update on my thinking.I think it is cheap what we can do sometimes, while this history has never been completely told? What is it I mean? It is a way in which I look at life and the way in which it came together for me. If such a source is recognized that emanates the very constructive phases of all life, then, what was the underlying substance of this creation if it could not be expressive? David Joseph Bohm (b. December 20, 1917, Wilkes-Barre, Pennsylvania - d. October 27, 1992, London) was an American-born quantum physicist who made significant contributions in the fields of theoretical physics, philosophy and neuropsychology, and to the Manhattan Project. If a shaft of light entering a prism is sufficiently narrow, a spectrum results. In optics, a prism is a transparent optical element with flat, polished surfaces that refract light. The exact angles between the surfaces depend on the application. The traditional geometrical shape is that of a triangular prism with a triangular base and rectangular sides, and in colloquial use "prism" usually refers to this type. 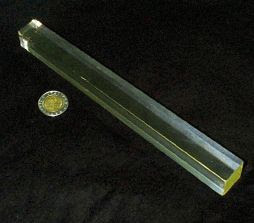 Some types of optical prism are not in fact in the shape of geometric prisms. Prisms are typically made out of glass, but can be made from any material that is transparent to the wavelengths for which they are designed. In optics, dispersion is the phenomenon that the phase velocity of a wave depends on its frequency. The most familiar example of dispersion is probably a rainbow, in which dispersion causes the spatial separation of a white light into components of different wavelengths (different colors). However, dispersion also has an impact in many other circumstances: for example, it causes pulses to spread in optical fibers, degrading signals over long distances; also, a cancellation between dispersion and nonlinear effects leads to soliton waves. Dispersion is most often described for light waves, but it may occur for any kind of wave that interacts with a medium or passes through an inhomogeneous geometry (e.g. a waveguide), such as sound waves. Dispersion is sometimes called chromatic dispersion to emphasize its wavelength-dependent nature. Configuration space to me would mean a relationship to the way tungsten bar of lead would have through it's coordinated dimensions as shown below pinpointed the results according to the space that this measure occupies? Now this could mean some totally different to th way I am seeing it, yet knowing full well the scope of the spectrum , the evidence to the contrary of that one wave, would have been the refractive differences shown not only in that Prism, but the elemental consideration as signature by the elements presence. When pushing back perspective it is of course used in concert with how we shall see the events unfold in the cosmos. Any measurement used in the LHC at this time is tied to that same understanding of events as they unfold for us, not only in context of this "whole universe," but on any subsequent events that happen within context of parts of that same universe. Bohmian mechanics, which is also called the de Broglie-Bohm theory, the pilot-wave model, and the causal interpretation of quantum mechanics, is a version of quantum theory discovered by Louis de Broglie in 1927 and rediscovered by David Bohm in 1952. It is the simplest example of what is often called a hidden variables interpretation of quantum mechanics. In Bohmian mechanics a system of particles is described in part by its wave function, evolving, as usual, according to Schrödinger's equation. However, the wave function provides only a partial description of the system. This description is completed by the specification of the actual positions of the particles. The latter evolve according to the 'guiding equation,' which expresses the velocities of the particles in terms of the wave function. Thus, in Bohmian mechanics the configuration of a system of particles evolves via a deterministic motion choreographed by the wave function. In particular, when a particle is sent into a two-slit apparatus, the slit through which it passes and where it arrives on the photographic plate are completely determined by its initial position and wave function. The calorimeter design for GLAST produces flashes of light that are used to determine how much energy is in each gamma-ray. A calorimeter ("calorie-meter") is a device that measures the energy (heat: calor) of a particle when it is totally absorbed. CsI(Tl) bars, arranged in a segmented manner, give both longitudinal and transverse information about the energy deposition pattern. Once a gamma ray penetrates through the anticoincidence shield, the silicon-strip tracker and lead converter planes, it then passes into the cesium-iodide calorimeters. This causes a scintillation reaction in the cesium-iodide, and the resultant light flash is photoelectrically converted to a voltage. This voltage is then digitized, recorded and relayed to earth by the spacecraft's onboard computer and telemetry antenna. Cesium-iodide blocks are arranged in two perpendicular directions, to provide additional positional information about the shower. The complexity and sum over histories leaves an indelible pathway for all energy Disposition patterns(photons in the Electromagnetic Calorimeters), as well as, an adventure "within the confines of the Hadronic Calorimeters views." In a sense when referenced to a "configuration space," then what design of the calorimeter that we would measure the earliest signs o the universe in expression as the "supposed productions of the cosmos." That we could say, we have a "new view in the window of that same cosmos?" Iron wedges of the CMS forward calorimeter-Source from Quantum Diaries Survivor. Of course I am looking and trying to describe "Topo" in a different way. I do not want to diminish the significance of the mathematical intents. 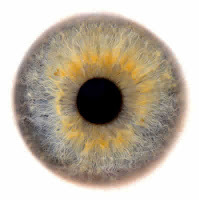 Just the realization of what we are doing with our perceptions, as we send them to extraordinary depth of of creation. Of course it was necessary to understand the evolution of Euclidean geometries to the non-euclidean, and the history associated with this. The word "Toposense" is one that becomes endearing when you realize that if your were to take to the meaning of "slide of light to heart" you would see the implications of what gravity could mean in the presence of the photon and it's explanatory revolutionary ideas about how it can encourage "Gravities Rainbow" here within context of this blog. "On the Effects of External Sensory Input on Time Dilation." A. Einstein, Institute for Advanced Study, Princeton, N.J. Unfortunately the link to the article below( now shows as Intuitively Excellent) has been removed from Scientific America's data base or has changed, or, I may of copied it wrong in my search. Nevertheless, I do not have the link, but would like to conclude the remark above, in terms of those pointed out for further repercussions of that conclusiveness. Einstein scholars disagree, but the pretty girl/hot stove experiment also may have led to another of his pithy remarks, namely: "If we knew what it was we were doing, it would not be called research, would it?" Then again, Einstein was a bit of a wag. Consider his explanation of wireless communication: "The wireless telegraph is not difficult to understand. The ordinary telegraph is like a very long cat. You pull the tail in New York, and it meows in Los Angeles. The wireless is the same, only without the cat." This quote reportedly kept Schrödinger awake well past his bedtime. So you look at the basis of interactions that Feynman produced in his Toy models and having some insight to the elemental consideration of those same interactions, what comes out, if we were to see the world in such a way, that continuity of expression is "the Wave that was generated in the very beginning," could have been reduce to some refractive expression of all life. The Spectrum, Hydrogen, or other wise. Do we then know the nature of the source, that we are all derivatives of some coherent plan that manifests toward the "cyclical nature of being?" Some Shakespearean version of, "to E or not to E?" No longer Reducible and Working from the Horizon? How far can our perceptions be pushed? Can consciousness still remain as part of this "ability of creation," that we are still "part and parcel" of it to consider it's full scope? So no geometrical idealizations in sight, other then to consider the significance of a place that is far removed from our looking to the cosmos, and while thinking about it, how far it has been reduce to a fuller picture of it's reality? Determinism (also called antiserendipity) is the philosophical proposition that every event, including human cognition and behavior, decision and action, is causally determined by an unbroken chain of prior occurrences. With numerous historical debates, many varieties and philosophical positions on the subject of determinism exist from traditions throughout the world. 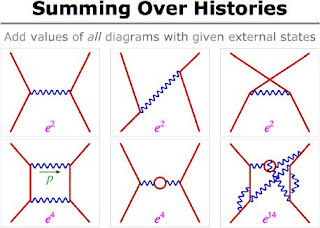 Some people have argued that in addition to the conditions humans can observe and the rules they can deduce there are hidden factors or hidden variables that determine absolutely in which order electrons reach the screen. They argue that the course of the universe is absolutely determined, but that humans are screened from knowledge of the determinative factors. So, they say, it only appears that things proceed in a merely probabilistically determinative way. Actually, they proceed in an absolutely determinative way. Although matters are still subject to some measure of dispute, quantum mechanics makes statistical predictions that would be violated if some local hidden variables existed. 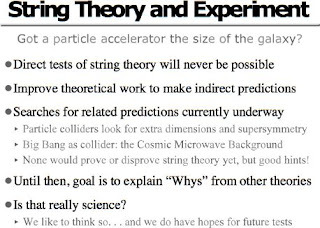 There have been a number of experiments to verify those predictions, and so far they do not appear to be violated although many physicists believe better experiments are needed to conclusively settle the question. (See Bell test experiments.) It is, however, possible to augment quantum mechanics with non-local hidden variables to achieve a deterministic theory that is in agreement with experiment. An example is the Bohm interpretation of quantum mechanics. So quantum mechanics is deterministic, provided that one accepts the wave function itself as reality (rather than as probability of classical coordinates). Since we have no practical way of knowing the exact magnitudes, and especially the phases, in a full quantum mechanical description of the causes of an observable event, this turns out to be philosophically similar to the "hidden variable" doctrine. Libertarianism is a philosophical position in metaphysics with respect to free will and determinism. It entails the belief that human beings possess free will, that free will is incompatible with determinism, and that determinism is false. 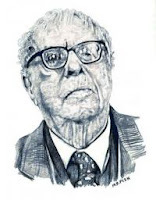 Although not held by the majority of contemporary philosophers, libertarianism is still widely discussed and avidly defended by several leading philosophers in the field, such as Peter van Inwagen, Robert Kane, Timothy O'Connor and Laura Ekstrom. Naturalistic libertarians believe that the universe contains an indeterminstic element, for instance as demonstrated by quantum mechanics, and that human beings exploit this to achieve freedom of choice. There is no separate, dualistic self in this theory: the self is the total activity of the brain as a system. At one time, it was assumed in the physical sciences that if the behavior observed in a system cannot be predicted, the problem is due to lack of fine-grained information, so that a sufficiently detailed investigation would eventually result in a deterministic theory ("If you knew exactly all the forces acting on the dice, you would be able to predict which number comes up"). However, the advent of quantum mechanics removed the underpinning from that approach, with the claim that (at least according to the Copenhagen interpretation) the most basic constituents of matter behave indeterministically, in accordance with such properties as the uncertainty principle. Quantum indeterminism was controversial on its introduction, with Einstein among the opposition, but gradually gained ground. Experiments confirmed the correctness of quantum mechanics, with a test of the Bell's theorem by Alain Aspect being particularly important because it showed that determinism and locality cannot both be true. Bohmian quantum mechanics remains the main attempt to preserve determinism (albeit at the expense of locality). The Bohm interpretation of quantum mechanics, sometimes called Bohmian mechanics, the ontological interpretation, or the causal interpretation, is an interpretation postulated by David Bohm in 1952 as an extension of Louis de Broglie's pilot-wave theory of 1927 . Consequently it is sometimes called the de Broglie-Bohm theory. Bohm's interpretation is an example of a hidden variables theory. It is hoped that the hidden variables would provide a local deterministic objective description that would resolve or eliminate many of the paradoxes of quantum mechanics, such as Schrödinger's cat, the measurement problem, the collapse of the wavefunction, and similar concerns. However, Bell's inequality complicates this hope, as it demonstrates that there is no local hidden variable theory that is compatible with quantum mechanics. Thus, one is left with choosing between the lesser of two evils: discarding locality, or discarding realism. The Bohmian interpretation opts for keeping realism and accepting nonlocality. Others see the consequences of EPR and Bell's theorem in a different way. They regard the correct conclusion to be related not so much to quantum theory itself, but only to deterministic interpretations of the same (i.e., to hidden-variable theories such as Bohm's interpretation). According to the people who think this way, what has been shown is that all deterministic theories must be nonlocal. For example, Niels Bohr was a member of this group. This group would claim that retaining orthodox quantum mechanics — with its nondeterministic character — permits one to retain locality, or at least to avoid the EPR type of nonlocality, at the expense of having no way to picture particles as objective elements of reality that occupy definite regions of space at all times. Armed with such a viewpoint, these physicists tend to be less receptive to Bohm's interpretation. Explicitly non-local. Bohm accepts that all the branches of the universal wavefunction exist. Like Everett, Bohm held that the wavefunction is real complex-valued field which never collapses. In addition Bohm postulated that there were particles that move under the influence of a non-local "quantum- potential" derived from the wavefunction (in addition to the classical potentials which are already incorporated into the structure of the wavefunction). The action of the quantum- potential is such that the particles are affected by only one of the branches of the wavefunction. (Bohm derives what is essentially a decoherence argument to show this, see section 7,#I [B]). The implicit, unstated assumption made by Bohm is that only the single branch of wavefunction associated with particles can contain self-aware observers, whereas Everett makes no such assumption. Most of Bohm's adherents do not seem to understand (or even be aware of) Everett's criticism, section VI , that the hidden- variable particles are not observable since the wavefunction alone is sufficient to account for all observations and hence a model of reality. The hidden variable particles can be discarded, along with the guiding quantum-potential, yielding a theory isomorphic to many-worlds, without affecting any experimental results.